So much for good intentions. While setting out to avoid distractions I got distracted, and had hours of fun (OK, hour of fun -- maybe two) putting together a 2010 calendar using Lulu. I already had the raw material -- the Celtic Tree Calendar series I made last year -- so just experimented until I got what I wanted. I decided to go with the less expensive version and only take a wee profit so it's very reasonably priced. More on the meanings behind the Celtic lunar tree calendar here. Check out the calendar here. Before I go I must share this. As an (admittedly-lame-and-have-totally-lost-interest) Etsy vendor I haven't laughed so hard in ages. Take your time and check out the disclaimer and post titles while you're there. posted by andrea at 8:05 p.m. If my med. students friends from the 60s see that toilet paper...they may well sue for copyright infringement! .... and thanks for the laugh .... I'm gobsmacked! At least it's a beautiful and profitable distraction that's art related! Very nice calendar. Good luck with your sales! Will we be find it at Etsy or at RegrEtsy? And that site is a hoot! 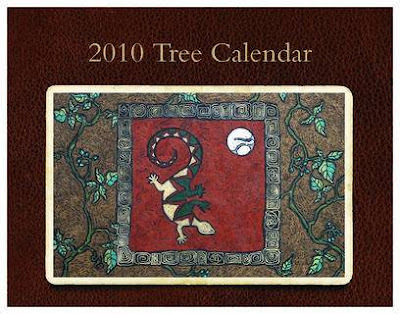 Received my 10 Celtic Tree Calendars today Andrea! Imagine my shock and horror when we opened the package up and there was another calendar on top made by a family with young children! (no, we don't know them!) They even have the family birthdays printed on the text. Creepy, no? Thankfully your calendars were also in the parcel but we were worried. Next I tried to figure out how to contact Lulu and advise them of the error. That was an exercise in frustration. Oh well. I feel for the family who didn't get their calendars. I guess I will have to destroy these ones. Freaky really.